Note: The following is an excerpt from my 2009 book Wind Energy Basics Revised: A Guide to Home- and Community-scale Wind Energy Systems. I am reprinting it here because of the constant re-invention of Darrieus or Vertical Axis Wind Turbines (VAWTs) and the presentation of these devices as though nothing like them has gone before. The data presented here is from actual performance records collected by the state of California. The most successful VAWT in history was that developed by FloWind in the early 1980s. Using what has become a rather conventional two-blade phi-configuration or “eggbeater” Darrieus, FloWind installed more than 500 turbines in California’s Altamont and Tehachapi passes. 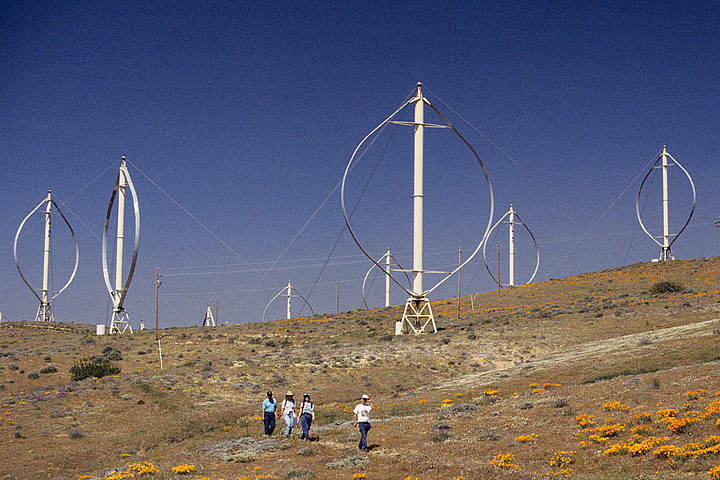 By the end of 1985, FloWind, an American manufacturer, had installed 95 MW of its signature product. For comparison, that’s equivalent to more than 15,000 of Quiet Revolution’s sleek 5-meter (16-foot) diameter turbine. At their most productive in 1987, FloWind’s fleet generated 100 million kilowatt-hours—enough electricity for nearly 20,000 California homes. No VAWT manufacturer to this day has ever come close to rivaling that accomplishment. On any windy day in Tehachapi during the late 1980s, the sun could be seen glinting over hundreds of Flowind’s turbines spinning atop Cameron Ridge. However, generation began collapsing as serial failures in the joints between the sections of extruded aluminum blades overwhelmed the American company. By the late 1990s, FloWind was generating one-tenth the electricity it had in 1987. By the end of 2004 nearly all of FloWind’s Tehachapi turbines had been removed and sold for scrap. Some relics were still standing in the Altamont pass in 2003, though they too were slated for removal. 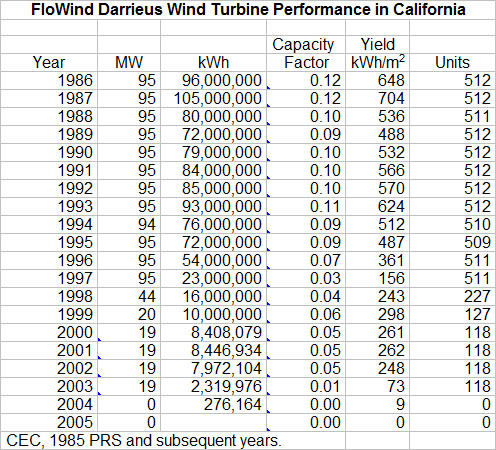 By the time the last of FloWind's turbines were taken out of service, the fleet of Darrieus turbines had generated a lifetime total of nearly one billion kWh. It is unlikely that any VAWT will ever come close to that record. The wind industry worldwide learned a lot from the FloWind experience. FloWind proved without a doubt that VAWTs could reliably generate commercial quantities of electricity—at least for a decade. But FloWind’s aggressive marketing and high power ratings have tainted vertical-axis technology ever since. Much of today’s cynicism about new VAWTs derives from FloWind’s hype about its turbines and its manipulation of power ratings. FloWind’s turbines were large commercial wind turbines of the day. They built two models: a 17-meter and 19-meter version. The 17-meter turbine, for example, was about 17 times the size of the architecturally dramatic Quiet Revolution QR5. Characteristic of FloWind’s marketing, and that of other Darrieus turbines of the day, including DAF-Indal, and VAWTPower, was the turbines’ high power ratings. FloWind’s 17-meter model was rated at 142 kW at a wind speed of 38 mph (17 m/s), their 19-meter model was rated at 250 kW at a wind speed of 44 mph (~20 m/s). For comparison, that’s a Force 8 or “fresh gale” on the Beaufort scale. Translation: That’s so windy no one in their right mind wants to be outside. To understand these power ratings, it’s necessary to look at the area swept by the eggbeater-shaped rotor. FloWind’s 17-meter model swept 260 m2, equivalent to a conventional wind turbine 18 meters (60 ft) in diameter. The 19-meter model swept 340 m2, equivalent to a conventional wind turbine 21 meters (70 ft) in diameter. Today, turbines of this size are considered small commercial turbines. For comparison, a conventional wind turbine 18 meters in diameter would typically be rated at 100 kW, and a 21-meter turbine would be rated at 150 kW. Thus, the FloWind turbines were overrated in comparison to their peers by at least 50%. The high ratings of the FloWind machines translate into a specific capacity 546 W/m2 for the 17-meter model and an incredible 735 W/m2 for the 19-meter model. Another way of saying this is that the 17-meter model had a specific area of 1.8 m2/kW and the 19-meter model a specific area of 1.4 m2/kW. Conventional turbines of the day swept 2.5 m2 for every kW of generator capacity. That FloWind was greatly overstating the potential performance of its turbine was reflected in its average capacity factor, a measure of performance relative to the size of the turbine’s generator. The capacity factor of FloWind’s turbines never exceeded 12 percent on average and was often less than 10 percent at a time when conventional wind turbines were delivering twice that. Why were FloWind’s power ratings so high? Wind turbines of that era were often sold to uninformed investors who compared wind turbine prices based on the cost per kilowatt of installed capacity. FloWind’s aggressive power ratings enabled them to charge far more for their turbines than they were worth. FloWind’s turbines were never truly in the 150 kW or 250 kW size class, but that’s what they charged their investors. Despite these outlandish power ratings, FloWind’s Darrieus designs turned in a respectable performance relative to the area of the wind stream swept by the two-blade rotor. During good years, Flowind’s machines would generate 500 to 600 kWh/m2/year, competitive with conventional wind turbines of the day. The bottom line: FloWind’s Darrieus turbines operated for about a decade generating millions of kilowatt-hours, and in doing so delivered respectable performance until fatigue and design weaknesses led to increasing unreliability and they were removed. FloWind’s turbines, when in regular service, delivered about the same performance as nearby conventional wind turbines relative to their swept area, but performed poorly in comparison to their inflated power ratings. Because of scale effects, it is unlikely that the small wind turbines of the modern VAWT revival will approach the historical performance of FloWind’s large wind turbines.